Kitty Alice Snead has traveled extensively to ancient cultural centers of the world. She observed that over time, the peoples who built those civilizations have been conquered, dispersed, assimilated, and in some cases, annihilated; what remains are crumbling, hollow ruins and the languages and customs of the past are lost. The history of the Tarahumara is different. They were never conquered. These ancient peoples did not congregate in great cities or pueblos. Living in family units apart from their neighbors, they came together as a community only for festivals and religious rituals honoring planting and harvest. When the Spanish first encountered the Tarahumara in what is now the state of Chihuahua, they found no cities to conquer, or temples of gold. The Tarahumara fought, then withdrew to the more inaccessible mountains and canyons of the Sierras. The Conquistadors did not track them since they were fierce fighters and had nothing the Spanish valued. The priests stayed, building missions and schools. 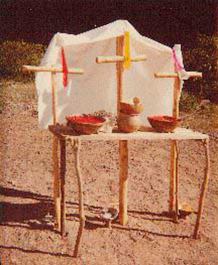 The Tarahumara incorporated Christian rituals into their belief system, then continued on as before. What did change their lives was the introduction of domesticated animals. As they learned to keep herds, and to use the waste as fertilizer in the weak rocky soil, they were able to grow higher yeild crops and to develop a system of rancherias. If the priests failed to make “good Christians” of the Tarahumara, the animal husbandry and farming methods changed the very nature of these indiginous peoples. It became the work of women and children to tend animals. Boys growing up in nature, isolated from peers, did not develop the strong, competitive skills a warrior needs. They lost their fierceness, and became shy, patient farmers. A different assault was mounted on Tarahumara lands during the late 19th and early twentieth centuries, Mining and timber companies, followed by mestizo farmers, encroached upon the Tarahumara. Again, they moved deeper into the canyons. Today, as in ancient times, the Tarahumara live in caves or small stone houses on remote rancherías. They are subsistence farmers and herdsmen, spending most of their lives out-of-doors. Men, women and children travel long distances on foot, and they are known and respected for their abilities as long distance runners. They also retain their language, Rarámuri, and a system supporting theoretical beliefs in cosmology, religion, and healing. Strict rules apply to social interactions and to the election of officials for their legally recognized system of self-governance. They emphasize both self-reliance and communal work for planting and harvesting crops. The government of Mexico recognizes the cultural significance of the Tarahumara, naming them a National Treasure and by building them community centers which have health clinics and Spanish-language boarding schools. In times of famine, families are enticed to send their children to these public schools in order to feed them which means their children become linguistically and culturally plural. Separated from the family’s guidance, youths are choosing to leave traditional lifestyles, going to the cities in search of jobs and a “better” way of life. To encourage economic development, the government is building roads which attract the lumber, mining, and tourist industries bringing more jobs to the Sierras. The clear cutting of forests is impacting the natural beauty of the landscape, the environment, and the habitat of the Tarahumara. Large numbers of non-indiginous people coming in bring diverse cultural influences that effect all but the remotest Tarahumara. Those living close to mestizo pueblos and roads behave and dress quite differently from the secluded, traditional populations. Once again, others encroach on the lands, resources and traditions of the Tarahumara. Will they continue their history and remain unconquered?